Against the backdrop of rapid technological changes, industry is constantly amplifying its capabilities through new models and processes. Technology is disrupting the business order, and the rate of this disruption is gaining pace. This accelerating pace of change is affecting industry which is striving to remain competitive and contemporary and Innovation is a critical component in improving individual and institutional performance. 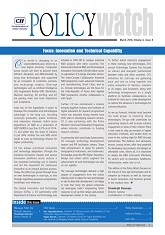 CII has been driving various initiatives to ensure preparedness for future Innovation and new age Technologies and has undertaken policy advocacy and various initiatives to enhance the innovation capacity of the Indian Industry. Knowledge areas like IPR, Higher Education and Design, which augment the advancement of new and innovative technologies are also given high importance. This edition of policy watch touches upon this important aspect of our economic growth, which is powered by innovation and technology and is supported by new age entrepreneurs.